Home Feng Shui health home job make money money what is Feng Shui worldhealthinfo WANT TO ATTRACT A LOT OF MONEY IN YOUR HOUSE? HERE’S HOW WITH FENG SHUI! Before we start, and show you the best way to attract money in your life, I would like to ask you a simple question – do you know what’s Feng Shui? We can answer that question for you – Feng Shui is an ancient Chinese technique that examines the interaction of people and their environment that has been practiced for thousands of years. According to the experts, the words Feng and Shui actually mean “wind and water”, signifying the invisible powers in heaven and the flow of energy of the Earth. It strives to help you bring balance and harmony into your surroundings by applying the principles of the natural flow of energy. The Feng Shui technique is based on the principle that all living and non-living things exist in the realm of the endless Universe that pulses with chi, or the life force. “Chi” is a good, uplifting, renewing kind of energy that benefits our health. How to Attract Money in Your Life? According to the Feng Shui experts, this is one of the most popular plants, for which is believed that it can bring good luck, wonderful friendships and material wealth. Its name is Crassula Ovata, also known as Jade Plant, Lucky Plant, Money Plant, Pink Joy and Dollar Tree. You will love this plant, not only because it is beautiful, but because it is very resilient and easy to look after. This beautiful and evergreen plant is native to Africa, but it has become a very popular and well-loved houseplant all over the world. 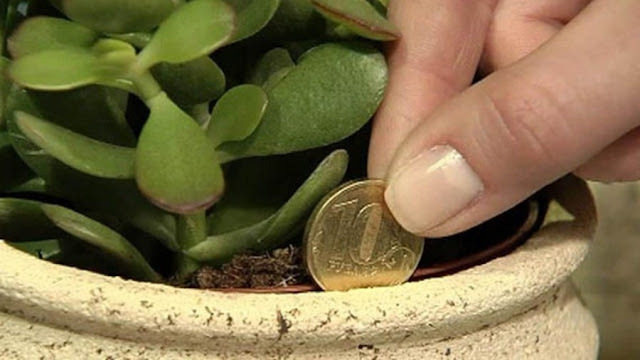 Its beautiful jade-green leaves are oval-shaped and resemble coins. They are thick, glossy and smooth and they store water. You should also know that Crassula can produce small white or pink flowers that resemble stars in early spring. And, depending on the level of sunlight, the leaves can get a pretty red color on their edges. As we said, according to the Feng Shui experts, this plant is a symbol of good luck, so it is a perfect housewarming gift believed to bring overall prosperity, fortune and wealth. If you want to congratulate someone on a new business or marriage, Crassula is a wonderful choice – its leaves have a beautiful jade-green color that stands for growth and renewal, while the shape of the leaves resemble small coins, attracting material wealth and prosperity to the owner. If you want to use this plant to attract money in your life, then you should put it in the southeast corner of your home, and it is believed that each new leaf will increase your wealth. This plant also represents deep friendship, especially when it blossoms. The beautiful pink and white flowers reflect the gentle care and attention that the owner has given to it, just like the care and the attention that we give to beloved friends.